FONTANA – Every Saturday at 9:30 AM ten junior teams compete at Foothill Lanes. Lee Fitzgerald, Foothill Lanes junior coordinator, and silver coach BOBBY LYONS coach and mentor Fontana’s youth. Lee and Bobby have 50 years of coaching experience and offer their youth bowlers a great opportunity to become better bowlers. More important Lee and Bobby offer their youth bowlers the opportunity to become better people. These coaches emphasize integrity, sportsmanship and responsibility. Austin Veteto is currently the top junior in the program with a 188 average. He recently rolled a 277 game and has a season high series of 663. Anthony Watson and Zach King are second and third with averages of 180 and 177. I’ve bowled with Zach on numerous occasions and he is a real pin banger. He is a striker first and is capable of high scoring. The girls are doing well with Mackenzie Chewning and Hanna Smith averaging 153. Raelynn Boswell has the high series of the season with a 565 with Chewning’s 231 being the high game. Other highlights include Jessica Pruett bowling a 208 game, 100 Pins above her 108 average. Rolling a game one hundred pins above your average is rare and a great accomplishment. Bryan Baker rolled a 211 game while carrying a 143 average.Earlier in the season he bowled a 215. Bryan’s high set of the season is 498. 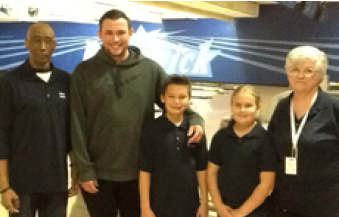 Great bowling boys and girls and congratulations to Lee and Bobby for conducting a great youth program. Thanks to the BOWLING NEWS for supporting CALIFORNIA youth bowlers.